You are traveling to Europe in the summer and you don’t know what to pack. Uhm, do I need actually those packing cubes? How many pairs of shoes shall I pack? Stressing about packing is the worst thing you can do before your vacation. No worries, I’ve got you covered. 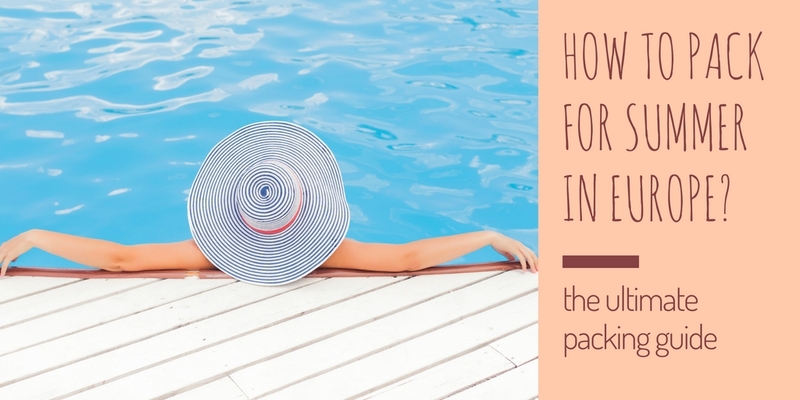 Here you will find all your burning questions regarding packing for Europe in the summer answered plus a printable packing list, which you can personalize with your name, the trip and the trip dates. Preparing for travel shall be exciting and enjoyable and not stressful and overwhelming. Now, I can pack 2 suitcases and 2 daypacks (for me and my partner) in less than an hour for anywhere around the world without forgetting anything, but it hasn’t always been like that. I remember stressing about packing weeks before the trip, making lists of things not to forget, things to buy, then having sleepless nights before the trip, then rechecking the next day once again if everything is packed, going 20 times through the packing lists I have made, panicking at the airport that I’ve forgotten something, and ending up arriving at the destination only to discover that I forgotten to pack my pj’s. Read further or go directly to the download section. and you will be happier in general. Therefore, doing your research before packing is crucial. Preparation is key to worry-free and efficient packing. Read carefully the first section and answer the questions for yourself. Thus, you will determine what you will need for your trip, as there isn’t such a thing as one-fits-all packing list. I will be also sharing with some personal experience. OK, let’s say some bad choices or mistakes, so that you don’t need make them as well. 1 How to pack for Europe if traveling in the summer? 1.1 How long will you be staying in Europe? 1.2 What is the baggage allowance of your airline? 1.3 Which country (-ies) are you visiting in Europe? 1.4 Where will you be staying? 1.5 What type of holiday it will be? 1.6 How will you move around in Europe? 2 What to pack for Europe in the summer? 2.3 Which toiletries to pack for Europe in the summer? 2.5 What electronics should you take on your trip to Europe? 2.6 What clothes should you pack for Europe in the summer? 2.7 Which accessories will you need on your trip to Europe? How to pack for Europe if traveling in the summer? How long will you be staying in Europe? The duration of your stay will determine what or how many to pack. If you are going only for a short break of about let’s say 4-5 days, you might consider traveling only with a carry-on. You can choose between a backpack or a carry-on bag. Read further to determine which one is more suitable for your trip. If you are staying longer – 5 days or more, then a suitcase will be better or a larger backpack. This, however, doesn’t mean that if you are staying a month you will need two suitcases. What is the baggage allowance of your airline? Before you start packing, check what size luggage is allowed by the airline you are flying with. Check also the weight restrictions and how many items you can check-in and bring on board. You don’t want to go through the hassle of oversized luggage or checking in at soaring prices extra luggage items at the airport. Been there, done that. Once I was visiting my family and had to throw away 5 packs with coffee at the airport, because my suitcase was exceeding the 10 kgs allowed. I wasn’t happy then. Always weigh your luggage before the trip. If you don’t have an electronic scale, I strongly advise you to invest in one. Tip: Check also the requirements of your connecting flights and on any flights within Europe, as they may have different requirements. Which country (-ies) are you visiting in Europe? Depending on where you are going you will need to pack differently. There’s no such a thing as one-fits-all packing advice . For Southern Europe (Italy, Spain, France, Portugal, Greece) you will need one type of clothing, for Northern Europe (Norway, Finland, Iceland) – another. Tip: Check the weather forecast before you go. It could be an extremely hot or wet summer. Don’t rely on the assumption that it should be most likely warm in June in the Netherlands. Obviously, if you are staying in hostels you will need different stuff compared to if you are staying in hotels. So, you won’t need that travel clothesline, as recommended on many packing lists for Europe, unless you will be camping or staying in a hostel. Also, you won’t need the quick-drying travel towel. Hotels in Europe provide towels, so you don’t need to bring your own, unless of course you intend to camp or stay in a hostel. What type of holiday it will be? Will it be an active holiday? Or a city trip? Or a beach holiday? Are you doing a lot of hiking and outdoor activities? You won’t probably need those hiking shoes if you are going to spend 2 weeks on a beach in Spain, but if you intend to do a bit of hiking, then you should probably pack them. Or do not consider packing that beautiful swimsuit if you are going to Rome, Paris or Berlin, unless your hotel comes up with a swimming pool. How will you move around in Europe? Another thing to consider before starting to pack is what type of transportation you will be using during your vacation? Are you staying only at one place? Or maybe you will be making day trips? Then you should take an extra daypack on top of your suitcase. Will you be renting a car? Then you might need some car accessories. Will you be using a lot trains or buses to move around, then you should probably leave that huge suitcase back home and take a backpack in combination with a carry-on bag. The lighter you travel, the happier you will be. I remember dragging my huge suitcase up a street in Cork (Ireland) in combination with a heavy backpack, cursing and sweating and promising myself I will never ever again make this mistake. Have you considered all above? Let’s start making your packing list for Europe now! What to pack for Europe in the summer? Passport – it is obvious that you will need it, but it is so easy to forget it. It should be #1 item on your packing list. You can use a passport wallet or a passport cover to protect your passport. Luggage – very important to make the right choice. Go once again through the How to pack section, so that you decide on what to use: a suitcase, a carry-on bag, or a backpack. This will further determine how many items you can pack. Daypack – you will need it if going on day trips or during excursions. – my personal opinion is that they aren’t practical, but a lot of travelers swear by them, so you can try them and judge by yourself whether they work for you or not. Which toiletries to pack for Europe in the summer? Refillable bottles – if you don’t have ones, you should buy a set of refillable bottles. They are reusable and will be the best investment for your trip. You can fill them with your favorite products, so you won’t need to buy each time mini-versions or carry that 28 oz bath shower gel tube with you when you travel, unless, of course, you plan to shower 25 times a day. Clear bag for toiletries – you will need this one if you travel with a carry-on. It’s better to buy one that is durable. Thus, you will avoid the hassle at security, transferring all your toiletries into a ziplock bag there, or using each time a new ziplock bag. Even if you don’t travel with a carry-on, it’s a good idea to use such a bag. Having your shampoo spilled all over your sneakers and sandals is one of those disasters you want to avoid. Hanging toiletry bag – you might consider buying one of these, as your toiletries can stay extremely organized, especially if you will be changing hotels often (you don’t need to pack and unpack constantly) or if you are staying at hostels, where there’s limited place for your private belongings. I don’t own one, but I saw it used by someone on my last trip, so I think I’ll give it a try. Toiletry bag – this is something you will always need. It’s better to choose a bag that’s impermeable, thus if one of your liquids spills incidentally, your clothes won’t get spoiled. Tip: If you are traveling as a couple, you can combine the toiletries and you actually don’t need to pack double from everything, unless you have different needs or preferences. Perhaps, consider packing larger containers. Tip: Do not forget your sun screen. You will be out there exploring cities or nature all day long and your skin needs adequate protection. What electronics should you take on your trip to Europe? Camera – I don’t go anywhere without my compact camera. I love the point-and-shoot cameras and I have always been a great fan of Canon – now a proud owner of a Canon camera #4. Whatever camera you have, do not forget it. (before buying any SD-card, check whether it’s compatible with your camera), tripod (handy to make those great night shots), camera case. Tip: When buying a tripod for your camera, choose for a multi-functional one that can fit with your camera, smartphone or action camera. Laptop – this is a difficult one. Do you need your laptop during your holidays, provided that you can access everything via your smart phone? Not really. Is it nice to have it with you? Yes. I tend to always travel with my laptop, but I am a blogger, so I need it. If you have a notebook, it won’t take much space, so you might take it with you. Tablet – same as above. If you decide to take your tablet, leave your laptop home. I am sure you won’t need both. After all, you are going on vacation, so try to disconnect from the digital world, and try to connect with the place where you are. Travel adapter – one of the must-haves. Choose for a universal travel adapter as there are differences between the various countries in Europe. Should you forget it (it happens, believe me), most hotels will be happy to lend you one. You can also buy an adapter in Europe. Multiple USB charger – believe me this one is very practical when it comes to charging all your devices, as it might turn out that there are not enough sockets in your hotel room. Tip: Choose for one of those multi-functional all-in-one devices to cut both on costs and space in your luggage. Power bank – it’s always handy to have an extra power bank with you. USB car charger – if you are renting a car during your Europe trip, you will need this one. Otherwise it’s no use of taking it with you. Kindle – if you like to read a lot during your vacation, take your Kindle with you, otherwise leave it home. I personally take a book with me, as I like to read a paper copy and not on the screen. If you take your Kindle, you will have access to all your books. What clothes should you pack for Europe in the summer? If you want to blend and not look like a tourist in Europe, choose more stylish outfits. You won’t need your sweat pants and baseball cap – these can remain home. When packing your clothes focus on the mix and match possibilities of your outfits. I try to pack always clothes that combine with each other, thus each day you can wear a different outfit. Don’t be an over-packer. Packing light but clever is essential. Most hotels in Europe offer laundry services, so you don’t need to over-pack. Here’s a list of what you will need in general. How many items to pack, will depend on the size of your luggage, the type of your trip and the length of your stay. Note: This packing list is for women, but if you cut on the dresses and the bras and increase on the t-shirts and the shorts, it can be used for men, as well. Needless to say that guys can go also with a pair of shoes less. Long sleeve tops – you will need at least one of these. It is warm in the summer in Europe, but in the evening, it gets chillier. Consider packing more of these, if you are travelling to countries in Northern Europe or to a mountains region. Tank tops/short sleeve tops – pack a few of these, at least 3-4. Skirts – pack 2 or 3. When you are choosing your skirts and tops, make sure all combinations are possible. Shorts – pack 1 or 2. Consider the above as well. A clever option could be a pair of capris as they are pretty versatile. Trousers – 2 or 3 should be enough. Jeans are a great option. Think of the mix-match possibilities. Jacket or coat – remember it’s summer, so you won’t need to take your whole winter collection of jackets with you, one will suffice. When choosing which one to pack, consider whether it matches the rest of your clothes color-wise and length-wise. Fleece jacket – I like to have that extra fleece jacket. I wear it during the flight and it’s quite comfy if you need something warm. Dresses – do not pack more than 2 or 3 of these. Underwear – this is a tricky one. If you don’t mind washing your clothes or giving them to a laundry, then pack no more than 5 pairs. I personally pack one pair for each day for up to 3 weeks of travel. I know it might seem quite a lot, but it doesn’t take much space and I’d rather take one dress less, than do the laundry a few times. Bras – I recommend 1-2 per week, for up to 3 weeks if you don’t want to do the laundry. When packing, think of the colors of your tops and dresses, so that they match them. Consider of packing a strapless one, if you have spaghetti top or an off-the-shoulder dress. Socks – 2 or max 3 pairs. Of course, it will depend on what types of shoes you will be taking with you and whether you are prepared to wash socks in your hotel room. Swimsuit – if you are going on a beach holiday, you will need more than one. If there won’t be any swimming pools or other swimming opportunities, you won’t need one. Yoga pants or lounge pants – this is also one item that I always pack with me. PJ’s or a large comfy top – it depends on your sleeping habits, whether you’ll go for pajamas or for a comfy top, but just don’t forget it. It’s pretty irritating if you forget it, as you have to sacrifice another top or a t-shirt for this purpose. Flip flops – I always pack my flip flops – I use them under the shower or in the hotel. It goes without saying that you will need them if you going to the beach or if there’s a swimming pool in your hotel. , for example), which I can wear when I dress up. However, if I’m traveling only carry-on, the ballerinas are the first thing that stays home. You won’t need high heels, they can also stay in your wardrobe home. Tip: Don’t bring new shoes on your vacation. The chance they will hurt your feet is big. Instead, pack shoes that are comfortable and you know you can walk a whole day without problems. Which accessories will you need on your trip to Europe? Jewelry – do not pack expensive jewelry. Use a case or a jewelry travel organizer that cannot open during traveling. Once I had to fish out all my earrings from in-between the clothes as my jewelry box got opened in the suitcase. It wasn’t fun. – besides your sunglasses, don’t forget to take also your sunglasses case. Choose for a hard-cover travel friendly case. – you can use it as an accessory, to keep you warm or when entering churches to cover your shoulders. Hat – I strongly advice to take with you some kind of a hat or a cap to protect you from the sun, especially if you are travelling to Central or Southern Europe. For a beach holiday, it’s absolutely essential. If you don’t have space for a hat, you can take a bandanna. I don’t go anywhere in the summer without my red bandanna. Painkillers – you might consider taking with you some general painkiller pills or pain relief medication.
. They are not only discreet but also efficient. I always have a pack of them in my bag wherever you go. DEET or any other insect repellent – mosquitoes are quit nasty and you will need an insect repellent not only if you are camping. There are mosquitoes in the cities as well. After Bite or another insect bite relief – you will need this one for sure. Don’t leave to the chances and be prepared. Other medication or prescription drugs you might need. Swiss-army knife – I like them because they are compact and multi-functional. You need to invest once and you can take it with you on all your travels. Indispensable. My favorite ones are the Victorinox. – I personally don’t use them, but if you are a light sleeper, you might need them. Collapsible water bottle – when it’s empty it can be folded, so that it doesn’t take any space. You can refill it easily for daily use. At most places in Europe the tap water is potable, but if you wish you can buy also mineral water and refill your collapsible bottle each day. Tip: In some European countries there is deposit on PET bottles, so if you buy, for example one liter bottle of mineral water, you can return it at the super market and get back the deposit. Here’s a list of the countries in Europe where you can do this. Journal – handy to write things on the go or to take notes, or just to keep a journal of your trip. Collapsible umbrella – yep, you are traveling in the summer, but you should be prepared for some occasional rain showers. Ziploc bags or any other similar resealable bags – you can use them for your shoes, or for dirty clothes. Actually you never know when they will come handy. I like to be practical so I’ve created the ultimate packing list which you can download here. This packing list can be personalized with your name – quite handy if you need to pack for more people. You can also write the dates of your trip and where you are traveling to. Thus, you can keep the packing list and use it for reference for your next trip. There’s also a handy space where you can enter the number of items you will need. Do you have other packing tips? Share them with us in the comments! Or do you have questions for your upcoming trip to Europe? I’ll be happy to answer them. Did I forget something on the packing list? Let me know and I will add it! Have a safe trip to Europe! This is so incredibly helpful! I almost always overpack for travel and I know if I was doing a big summer trip I definitely would. A very useful post! reminds me that I need to add some things to my list for my upcoming Egypt trip! This is so useful! It can be so easy to forget things when packing and it can easily turn into a stressful chore at times. I like to pack light when I’m traveling to a bunch of different countries, so I always seem to forget at least one thing haha. Packing for Europe can seriously be such a chore! Especially when you’re bouncing from country to country and you don’t want to over-pack! I think traveling in summer is easier though, because the lighter clothes pack much easier.